Congrats Dani and Dan T.! 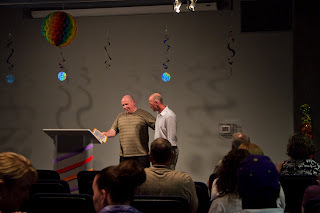 Last weekend the LifeChange recovery community honored two outstanding residents, Dani Nay and Dan Torgeson (aka "Dan T.") Dani completed the Cabinet (or third level) of LifeChange and is going on to study to be a nurse. 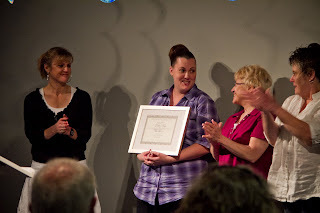 Dan T. is moving up to the Council (or 4th level) in LifeChange. Council members agree to serve as leaders of the LifeChange community to teach and mentor other residents. Dan T. at left is welcomed to the Council level by Council member Larry.